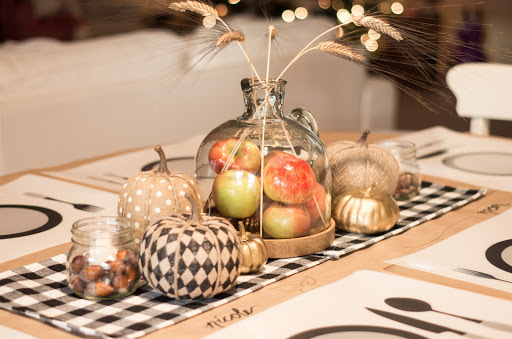 If you give a blogger some buffalo check….she will change her whole table centerpiece. 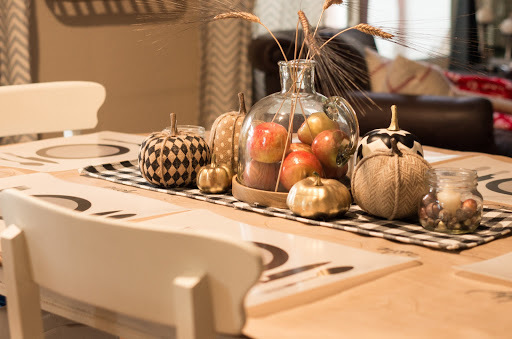 For this holiday season I wanted a black and white buffalo check table runner. And I wasn’t have much luck finding one. But I did find some thing similar in the Target One Spot…only they were placements! Place mats!!! And not enough place mats ever, only just 3 every time I went. So I finally spent $6 and decided I would just put a couple together and use them as a small table runner. 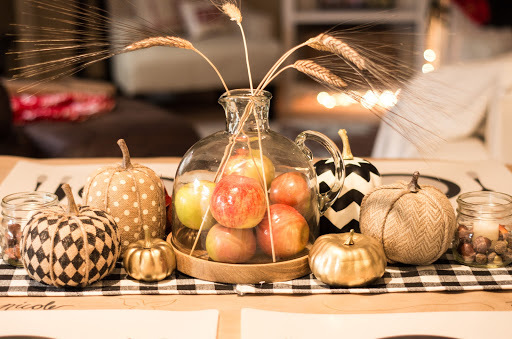 We always have an abundance of apples at our house and I love how they have a fall color to mix with an otherwise pretty neutral table. I used brown mailing paper as a table cloth and wrote the place cards right on it. I figured it’s great since most of our family is little kiddies, they can draw on it while the adults eat and we can all write down what we are thankful for this year. 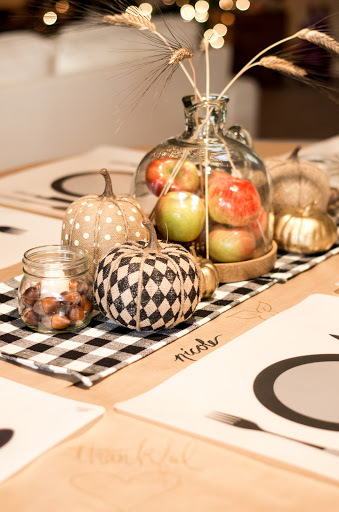 All the burlap pumkins are also from the Target One Spot and I have used them in different spots all season. I spray painted some old orange pumpkins gold earlier this year to match my gold accents in the living room. 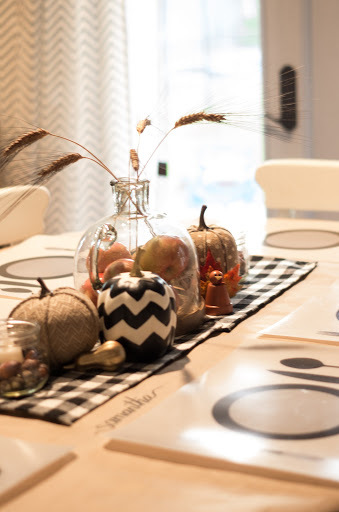 I also love how the new “table runner” matches our usual place-mats, and also will match our dishes (which I didn’t have time to get out for this impromptu table shoot). 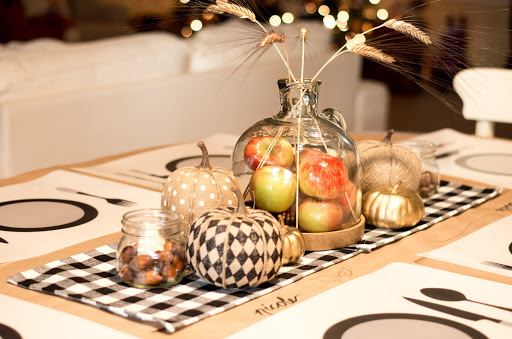 I stuck the wheat in the tablescape because it screams fall harvest to me. 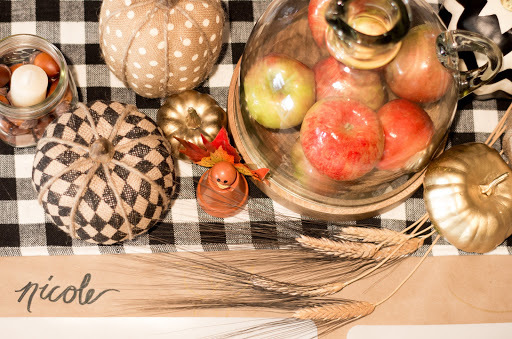 For the actual big day I might get the dried corn out again, to remind us of the first Thanksgiving. 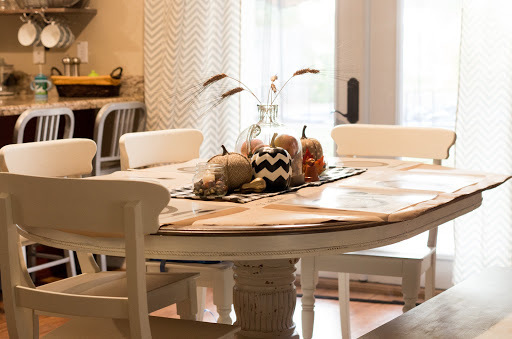 Faux Zebra Rug Tutorial – And playroom updates!